It's a Scrappy World: 2-1 New Release at Bugaboo Stamps! Today is New Release Tuesday at Bugaboo Stamps! It is the day when New Digi Sets are put into the Bug Shop! Jodie has added two super cool sets today, giving us an extra special reason to be excited! Woot! Woot! My card features Skye's Bear! Skye is the incredibly talented daughter of Jodie Mackrell, the founder of Bugaboo Stamps! We are all so happy to see her showcasing her considerable skillz alongside her proud mom, Jodie! We can't wait to see what else Jodie & Skye are going to wow us with! Head over to the Bug Shop to see all of today's new digis! They are sure to be awesome!!! how very bright and cheery! love it!! Love those bright colors. Great image! Thanks for joining us at Do You Stack Up. Very cute card...love the hearts and flower. Thanks for joining the Stampin B's. cool hearts and green loops around the flower! thank you for sharing at the pixie cottage! Cute card, Scrappy! Love those paper clips! Precious card and I love that sentiment. So cute. Oh my, how cute. Love the sentiment. Thanks for playing along at Catered Crop. Hi Scrappy, oh this is just adorable and so sweet!! Love this the spring colors and awesome sentiment! One fab flower there girl!! Thanks for sharing with us at StampFairy challenge! Wowzers!! I love your card. Your coloring skills are awesome!!! Love your doodling too. Thanks for joining us on the Simon Says Stamp Challenge blog. I hope to see more of your lovely cards again soon. Thanks again for joining at Creatalicious!!! Awesome card, Scrappy! Cute Cute image!!! Like the green and pink together, very Spring like. Thank you for joining in with Rainbow Lady's challenge this week. what a cute card. I love your spring-ish colors, they look so cute along with the flower you made!! Do not forget to stop by and grab your badge, you made it TOP3 in one of our last challenges!! Thanks for playing along with Stamp Fairy! Wonderful card and great sentiment. Thank you for sharing with us at The Pixie Cottage. Sweet card! Thank you for joining The Pixie Cottage Challenge. Thanks Scrappy another cute card. 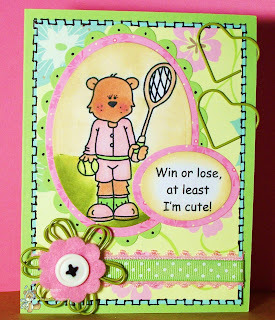 Beautiful spring card Scrappy! I love the cool stitching around the edge! Thanks so much for playing along with us at DYSU. Please join us again next week! Super Cute - great colors! Fabulous card Scrappy love that flower, image and colours thank you for joining us at Stamp fairy this week. This is so cute and lovely and bright too. Love your flowers and the spotty ribbon. Thanks for playing along at C4E and StampFairy this week. Adorable card and I love your handmade flower! Thanks for joining us at StampFairy! Very cute card! Thanks for entering Stamp, Scrap & Doodle Saturday's challenge this week. Good luck! So Cute!!! Thanks for playing along at Cupcake Inspirations this week! Cute card, love the cheery colours! Thanks for playing along with us at EIC this week! This is so cute! I love this sentiment! Thank you for playing along with us at Paper Playtime! We hope you join us again soon! What a cute card! I love your colours. :)And the heart-shape clip are perfect!